The Spokesman-Review took top honors in long feature writing, commentary and sports photography among the region’s largest newspapers in the 2012 Northwest Excellence in Journalism contest presented by the Society of Professional Journalists. The Spokesman-Review also placed second in general excellence for large daily newspapers. The Oregonian placed first and the Seattle Times was third. Becky Kramer took first in the long feature story category for “The new American dream,” a special report in April 2012 on the lure of high-paying jobs in the oil fields of North Dakota. John Webster won first place in the editorial and commentary category for a November column, “ The Old Party isn’t so Grand anymore,” about why he became disenchanted with the Republican Party. 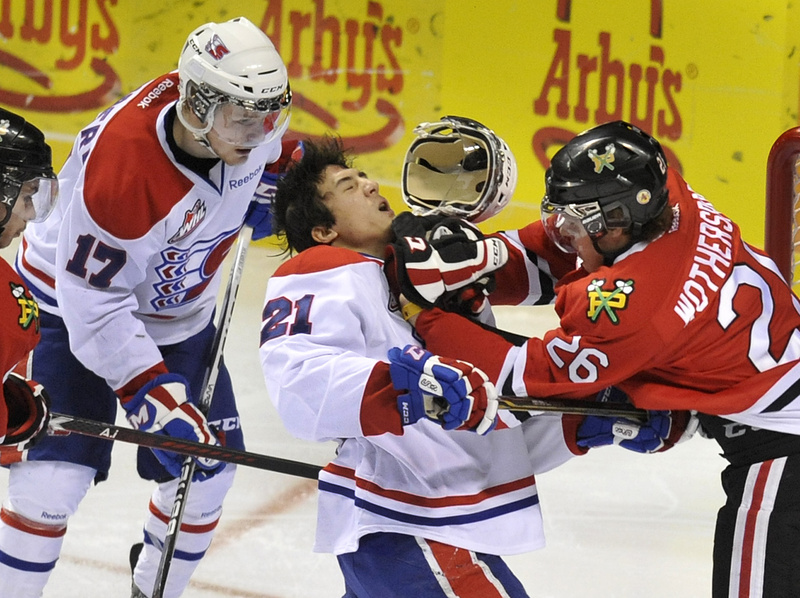 Colin Mulvany won first in sports photography for “Roughing,” a January 2012 photo of Dylan Walchuk of the Spokane Chiefs losing his helmet in a clash on the ice with the Portland Winterhawks. • Gary Crooks, second, editorial and commentary. • Colin Mulvany, second, news photography. • Kathy Plonka, second, portrait photography; third, sports photography; and third, photo story. • Ryan Pitts and staff, second, sports websites. • Jody Lawrence-Turner, third, crime and justice reporting. • Jonathan Brunt, third, government and politics reporting. The awards were announced Saturday in Seattle. Journalists from Washington, Idaho, Oregon, Montana and Alaska compete in the contest. Published: May 20, 2013, 11:19 a.m.